Hummus makes the world go round. And it makes for a healthy movie snack too! 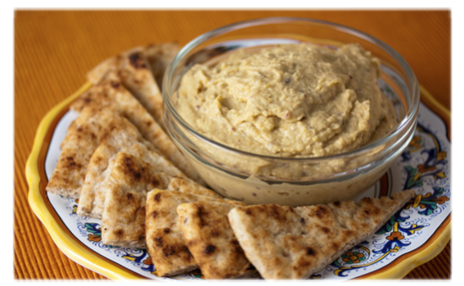 That is, if you make it yourself because many store-bought humus products are filled with unhealthy ingredients. Luckily this recipe is easy and fun to make. Grab a blender and blend the chickpeas (without their moist) till it is a smooth mixture and then add the tahina. Scoop out this mixture and put in a mixing bowl. Now mix in 1 or 2 crushed garlic cloves and lemon juice to taste. Put the hummus in a nice serving bowl and make a little ‘hole’ in the middle of the hummus and poor in some olive oil. Set aside. In 10 minutes, toast the wholewheat pita in the oven and then break it into little pieces. Serve this with carrot and celery sticks together with the hummus.